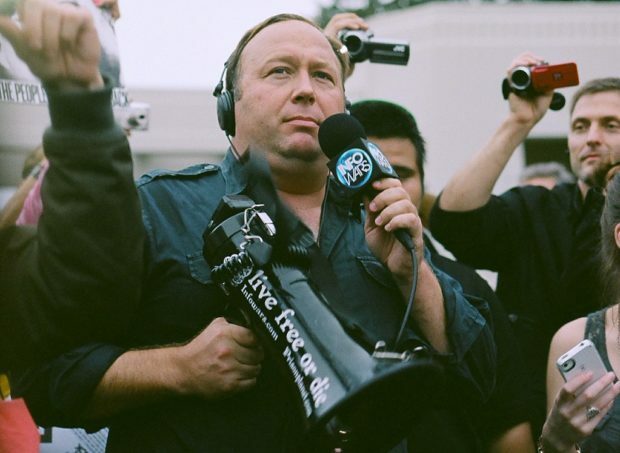 Alex Jones is an increasingly successful conspiracy theorist with his own media empire. He’s the one saying that Sandy Hook was faked using child “crisis actors.” He’s the one behind the stories of FEMA camps, and he’s the one (well, the latest one) promoting stories of a Jewish mafia of international bankers taking over the world (a very old conspiracy theory). Here’s the problem. Donald Trump, who is now a presidential candidate, actually listens to Jones and takes him seriously. He was introduced to Jones by Roger Stone, a Trump adviser (and law partner of Paul Manafort, who was briefly Trump’s campaign leader). Stone is also friends with Jones. So while Trump has never publicly confirmed that he listens to or is being guided by Jones, he has said a number of things that are very obviously coming straight from Jones. 5. Lock her up/Hillary for Jail: These slogans originate with Jones, though they’ve since been picked up by other Trump followers and are repeated ad nauseum at Trump rallies. 4. Hillary is Sick: Jones had for months been saying that Hillary Clinton was gravely ill, likely with radiation sickness from visiting Fukushima in Japan, the nuclear reactor that was damaged in the earthquake of 3/11/11. 3. There is no drought in California: There’s plenty of water, but the democrats are emptying all the fresh water into the sea to help some endangered fish. Trump went with this very specific, and wrong, story when he was campaigning in California. It originates with Jones. 2. Ever the conspiracy theorist, Jones thinks everything that doesn’t go his way is a conspiracy: Thus he started early on emphasizing that if Trump doesn’t win, it’s due to a conspiracy. 1. Voter fraud and rigged election narratives: Both stem from Jones, and Trump has been very vocal about them. Extra: In a recent Florida survey, 84 percent of Trump voters said that Mrs. Clinton should be in prison, and 40 percent said she was a demon. It’s Jones who is pushing both stories . . . yes, that Hillary (and Obama) are actually demons. This list owes a debt to Jon Ronson’s article, “The Elephant in the Room.” Ronson became friends with Jones in 1999 when Ronson was writing a book about conspiracy theorists, and Ronson then invited Jones with him to infiltrate The Bohemian Grove. Jones made that adventure into a documentary which played a significant role in catapulting him into the public eye, soon followed by him becoming vital to 9/11 trutherism.